Giving the example of “the recent stir against the proposed Mandal-Bechraji SIR, saying it is “one such case of anti-people projects in the garb of ‘development’”, the statement said, “It can only bring mass poverty, destruction of whatever is left of rural farming and agriculture and environmental catastrophe.” It added, “The impact of such steps on the lives of women and children in particular – severe malnourishment, adverse health impacts, curtailment of educational opportunities, forced migration, and trafficking – have never been factored into the ‘development’ discourse, keeping them invisible and yet the first victims of ‘development’." Sayng that all of it is happening in the name of development, it says, “This anti-people understanding of development is leading to jobless growth and massive impoverishment, malnourishment and distress suicides. These cannot characterise any society or economy as ‘developed’, but rather would constitute backwardness of the highest order. Indeed, Gujarat’s 11th rank (out of 23) on human development indices"
* The Gujarat Special Investment Region Act 2009 is violative of fundamental rights and therefore completely unacceptable to us and should be scrapped altogether. The Gujarat SIR Act 2009 under which the Mandal-Bechraji SIR is being proposed and undertaken does not have any provisions for safeguarding the right to livelihood, freedom to pursue occupations of their choice or their rights over the common and natural resources of the region like water, forests, pastures and clean air. The Act does not adhere to any fundamental rights, including the right to life and livelihood, their welfare, their rights to safeguard their culture, occupations and ways of life. Constitutionally mandated and elected bodies like the Gram Sabhas and Gram panchayats also do not find the right to represent their grievances. Such legislations would be unconstitutional and undemocratic. * Stop decommanding of the Narmada command areas. The people of Gujarat have been promised Narmada dam waters for the last 50 years. The farmers have waited patiently for the Narmada waters, which promise to make agriculture more attractive to farmers. Now when the entire infrastructure which will bring water to the fields is in place, the Government of Gujarat has come with a project which takes away their water and gives it to industry. This is unacceptable. We call upon the Government of Gujarat to stop decommanding of the Narmada command areas with immediate effect. * The Gujarat Irrigation and Drainage Act 2013 is a draconian piece of legislation and severely violates fundamental rights and needs to be withdrawn immediately. According to the Act a farmer cannot install a borewell in his/her fields without government permission. The farmers will now need a licence to draw water from canals and the amount of water that can be drawn by a farmer will be decided by the government. Even the price of water used in the fields for irrigation will be fixed and government officials have been authorised to file cases against farmers who break the law. The farmers will now need to declare the details of wells and ponds in their fields. This would make farming and agriculture a Herculean task and would deter farmers from pursuing agriculture. * Declare a moratorium on Cujarat Industrial Development Corporation's (GIDC’s) land acquisition. The GIDC has a huge land bank, developed over the years through acquisition of land from farmers ostensibly for ‘public purpose’. Much of this land is currently unutilised, as has been pointed out by the CAG reports. Despite this, the GIDC has continued to acquire land in several areas. Most often it resorts to veiled threats under which farmers are made to part with their land. These lands are then transferred to industrial houses which is illegal as it constitutes a change of purpose. GIDC’s data on land ought to be first put in the public domain for scrutiny. Till such time a complete moratorium of GIDC’s land acquisition. 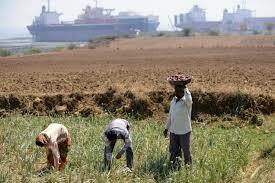 * The Government of Gujarat needs to come out with an Agriculture Policy. Agriculture as a sector has been neglected and no proactive policy measures, such as are made for industry, have been taken for it. The Government of Gujarat needs to come out with policy measures for promotion and sustenance of agriculture (as against agri-business or agro-industrial policy) as the primary economic sector even today. * The Government of Gujarat needs to come out with a comprehensive policy on the use, access to and maintenance of common property resources (CPRs). Forests, water bodies, pasture lands, wastelands, coasts, are crucial to the survival and well being of several communities in Gujarat. They provide primary and secondary sources of livelihoods to millions of landless families and communities. These have to be maintained and augmented (quantum and quality) in order for these people to survive. The rights of people over these resources (as against ‘government ownership) should form the bedrock of this policy. * The Government of Gujarat needs to unambiguously demonstrate its will to give land to Adivasis and to landless Dalits under the provisions of the Forest Rights Act and Land Ceiling Act respectively. Even when it claims on paper to have given the land, the actual possession of the land is never being enjoyed by the Dalits or Adivasis. The state machinery has not intervened on their side to ensure that possession of land actually materialises on the ground. * Declare a moratorium on sale of CPRs. Forests, pasture land (gauchar), wastelands (padtar), sea coasts are common property resources (against the convoluted understanding in government circles that it is of government ownership) on which many marginalised communities subsist, apart from them being absolutely necessary to maintain ecological balance. The coasts, now heavily privatised, are the sole means of subsistence for fisherfolk who depend on them for their livelihood. The gauchars are especially important to the maldhari community and other nomadic and pastoralist communities whose sole means of livelihood, cattle rearing and breeding, depends on gauchars. * The Government of Gujarat must come out with a white paper on land acquisitions in Gujarat from 1960 upto 2012. It should also include environmental impact assessment, social impact assessment and cost-benefit analysis of industrialisation (jobs created, nature of jobs, incomes earned, infrastructure, usage of this infrastructure ) in Gujarat since the formation of the state in 1960 up until 2012. * All land related information to be put in the public domain. The government needs to bring in transparency in its land dealings with industry and other established sectors. It needs to give out accurate and updated data on land use, land acquired, land leased etc. Transparency is also required in the method of zeroing in on particular parcel/s of land and the method of arriving at pricing and compensation to the landowners/losers.